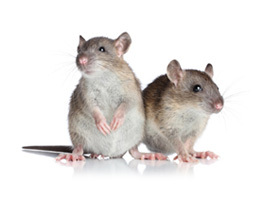 Vermin Control | Rat and mice pest control in Staines, Weybridge, Twickenham, Shepperton, Richmond. The type of rat living near to houses is the Brown Rat (also called the Common or Sewer Rat). The Brown Rat has a head and body length of between 8 and 11” and has brown fur on its back and grey under-neath, although sometimes black and white varieties are seen. The tail is shorter than the head and body and measures between 6 and 8”. Although rats have good senses of smell and hearing, their whiskers provide them with such a good sense of touch that they can quite easily find their way around in complete darkness. Rats are very agile and can even climb vertical walls if the surface is rough enough, but they are especially good at swimming. The house mouse is generally dusty grey with a lighter coloured underside. The head and body measures between 70 and 95mm with the tail measuring as much again. Adult mice can be confused with juvenile rats but there are two main features which distinguish between them. A juvenile rat has large feet and a large head relative to its size, an adult mouse has smaller feet and a smaller head. Mice breed rapidly and under optimum conditions a female can have a litter of around six every 40 to 50 days. The po-tential to cause problems is therefore vast. Mice are virtually incontinent and produce between 80 and 120 droppings per day, depending on their diet. Droppings will be found scattered wherever mice have been. The droppings are usually black, spindle shaped and measure around 1/4” (6mm) in length. N.B. In loft spaces mouse droppings may be confused with the droppings of bats. As stated, mice gnaw, simply to keep their teeth in good condition, therefore look for signs of teeth marks. Also look for any holes in the skirting boards and floor boards, especially where pipes enter as mice often move around in ceiling voids and cavity walls.